Iowa [[italics]]continued[[end italics]] The Genaro Vasquez Preschool began in December of 1972. It provided Hispanic Children with the opportunity to recognize their own skills in an atmosphere where their culture and language were appreciated and valued. The emphasis of the program focused on preparing non-English-speaking children for school. During 1972 the Chicano/Indian American Cultural Center had a prison visitation program at the Iowa State Penitentiary in Fort Madison, Iowa. 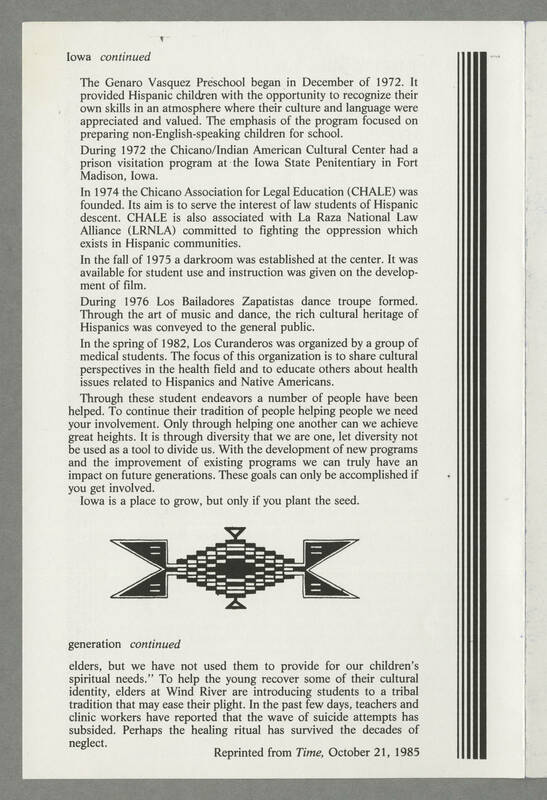 In 1974 the Chicano Association for Legal Education (CHALE) was founded. Its aim is to serve the interest of law students of Hispanic descent. CHALE is also associated with La Raza National Law Alliance (LRNLA) committed to fighting the oppression which exists in Hispanic communities. In the fall of 1975 a darkroom was established at the center. It was available for student use and instruction was given on the development of film. During 1976 Los Bailadores Zapatistas dance troupe formed. Through the art of music and dance, the rich cultural heritage of Hispanics was conveyed to the general public. In the spring of 1982, Los Curanderos was organized by a group of medical students. The focus of this organization is to share cultural perspectives in the health field and to educate others about health issues related to Hispanics and Native Americans. Through these student endeavors a number of people have been helped. To continue their tradition of people helping people we need your involvement. Only through helping one another can we achieve great heights. It is through diversity that we are one, let diversity not be used as a tool to divide us. With the development of new programs and the improvement of existing programs we can truly have an impact on future generations. These goals can only be accomplished if you get involved. Iowa is a place to grow, but only if you plant the seed. generation [[italics]]continued[[end italics]] elders, but we have not used them to provide for our children's spiritual needs." To help the young recover some of their cultural identity, elders at Wind River are introducing students to a tribal tradition that may ease their plight. In the last few days, teachers and clinic workers have reported that the wave of suicide attempts has subsided. Perhaps the healing ritual has survived decades of neglect. Reprinted from [[italics]]Time[[end italics]], October 21, 1985.